Description of "60 Shades of Green"
and UNDESA, New York, UNIDO, Vienna; DFID, London; GIZ and CDG, Germany; Asian Productivity Organization (APO), Tokyo; SIDA; Embassy of the Netherlands, New Delhi; FAO; the World Bank; IFC; Asian Development Bank and the New Development Bank, China. Apart from the Government of India and various State Governments, Dr Modak has advised the Governments of Bangladesh, Egypt, Indonesia, Mauritius, Thailand and Vietnam. Recently he was invited to join the India Resources Panel (for secondary material flows) by the Ministry of Environment & Forests and Climate Change, Government of India. 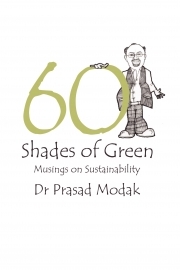 Dr Modak has published books with the UN University on EIA (translations in Chinese, Japanese), Tokyo; Oxford University Press; UNEP, Paris on Textile Industry and Environment and Centre for Environmental Education in India on Waste Minimization. He served as Hon. Editor of the Journal of Indian Water Works from 1998 to 2004. He coordinated the chapter on Waste Management and Recycling in UNEP’s Green Economy Report; contributed a chapter on Waste and Resource Management in UNEP/ISWA’s Global Waste Management Outlook and assisted UNCRD to establish IPLA - International Partnership for Expanding Waste Management Services of Local Authorities. Dr Modak has received the Distinguished Alumni Award of AITAA in 2010 for Significant Contribution to International Affairs. He was elected to the Board Certified Member at the American Association of Environmental Engineers in recognition of his work in research & practice. Music, Education, Travel and Environmental Movements are some of his passions in life. Reviews of "60 Shades of Green"